Seventh Hill is a design consultancy dedicated to transforming people and places through measurable experiences. Legend says great cities are built on seven hills. From ancient Rome to modern Seattle, from pilgrimage site Mecca to rapidly growing Kampala, dozens of cities around the world claim this same mark of greatness. Combining myth and geography, the story of seven hills has endured for centuries. But it's only one measure. As urban environments evolve, what are the various ways to measure their success? Seventh Hill believes great places are made from well-designed personal and physical relationships. The designed interactions between people and their surroundings occur during community engagement events, research activities, and everyday life. Rather than remain unchanged, relationships have the potential to transform both people and places. Achieving meaningful change experiences requires the integration of physical spaces, digital platforms, and social interactions. Seventh Hill designs environments to guide these processes of change. We help clients reach their seventh hill. How can we take action together? Rather than follow prescriptive methods, Seventh Hill combines urban design expertise with tailored evaluation tools to help clients achieve their desired outcomes. We partner with design firms, community organizations, and a wide-range of clients during early, middle, and final stages of transformative projects. Co-edited by David Jurca and Brad Valtman, COLDSCAPES is a book filled with small and large scale projects intended to ignite a creative spark in winter cities. From provocative notions of parking lot "snowscaping" to compact warming huts, the essays envision active public spaces through all four seasons. COLDSCAPES is the sixth volume in the CUDC's Urban Infill journal series. Started in 2015, MOOS is an award-winning program focused on engaging and empowering middle and high school students with the skills to transform their neighborhood public spaces. 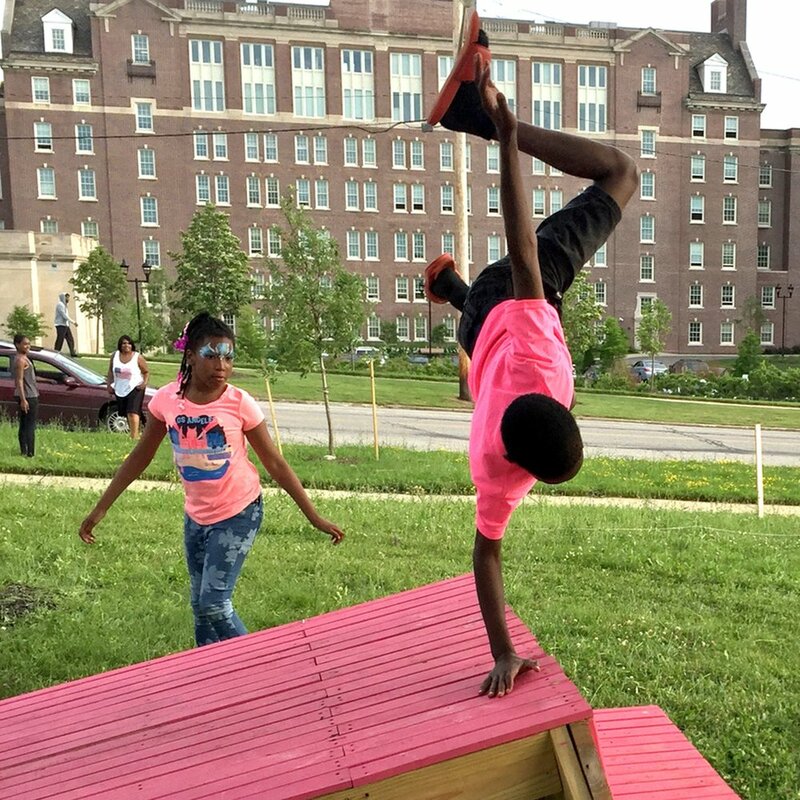 Through hands-on workshops, youth work with professional designers of color to imagine and build their own playscapes. The program is currently active in four Cleveland area neighborhoods, plus a podcast. What leads people to change their minds? OurChangeStories.org is a digital platform to better understand this process by sharing individual experiences of change. The online portal invites people of all backgrounds to share their stories about any personal change experience they find meaningful. Winner of Chicago's 2013 Activate Union Station placemaking competition, Blah Blah Blob! is an inflatable sculpture created from 300 yards of neon fabric. The interactive installation visually enlivens it surroundings, but also invites people to explore within. Several activities have been programmed inside the mobile space, including parties, group yoga, and music performances. Project partners included CUDC and Latent Design. Open to the public from April 21-27, 2012, Pop Up Rockwell was a one-week experiment to test "complete & green street" improvements on downtown Cleveland's Rockwell Avenue. Graduate students in an urban design studio led by David Jurca conducted the research, design, installation, and evaluation of real-world street transformations. Pop Up Rockwell is published in the book Tactical Urbanism and featured as a Context Sensitive Solution case study by the Federal Highway Administration. The desire for public seating and picnic areas along Glenville's E. 105th Street emerged from community feedback gathered during the 2017 INDEX Studio. Led by David Jurca and CUDC staff, the design allows users to rotate and flip the modular pieces upside down, forming benches in various configurations. Placed together, the benches create a platform for picnics or performances. Flip them upside down to reveal an undulating ribbon—or a long red cape. The SUPERSEATS are inspired by Glenville as the birthplace of heroes Jesse Owens, Harrison Dillard, and Superman. As the crow flies, it is 30 miles from Kent to Cleveland, and 40 miles if you drive. But there is another route between the cities—a historic route navigated before European settlement and formed from our glacial heritage. The Crooked River Commute is a 50-mile, two-day kayaking journey from Kent to Cleveland along the Cuyahoga River. Participants leave with a changed perception of their local environment. David Jurca has led the trip for five consecutive years and anticipates an epic Commute in 2019—the 50th anniversary of the Burning River. The Snowball Pavilion is a weather resistant wood structure, designed to provide an inviting outdoor space during all four seasons. Created by David Jurca, his Kent State students Leno Esposito and Derrick Behm, and architect Dru McKeown, the pavilion's gracefully curving frame serves as a cool, sun shaded oasis during hot summer days and transforms into a snow sheltered igloo in winter. The Cleveland Public Library (CPL) partnered with Kent State CUDC to lead an innovative approach to library planning. CPL150 is an EDRA award winning process to determine the appropriate services that will be offered at CPL's branch locations by 2019, the 150th anniversary of the library. While at CUDC, David Jurca managed the project and developed the design research framework, which resulted in four reports, covering 13 different library branches. Seventh Hill is led by David Jurca, an urban designer with over 11 years of professional experience guiding real-world projects and academic research. Prior to starting Seventh Hill, David was Associate Director at Kent State University's Cleveland Urban Design Collaborative, where he managed client projects at a range of scales, from city-wide redevelopment plans to tactical urbanism events. His work has been recognized with awards from the American Planning Association, American Institute of Architects, and Environmental Design Research Association. Internationally, David's design projects were exhibited by Chicago's Metropolitan Planning Council, Museum of Contemporary Art Cleveland, Van Alen Institute, Havana's Fabrica de Arte Cubano, and the Venice Biennale of Architecture. David is also an invited speaker on topics including, public placemaking, design for winter cities, urban data, and innovative community engagement methods. In 2013, David launched COLDSCAPES.org and co-edited the book "Coldscapes: Design Ideas for Winter Cities" to spur creative urbanism and livability year-round. He also co-founded Design Diversity, an initiative to promote people of color in architecture and design professions in Northeast Ohio. In support of Design Diversity’s mission, David started Making Our Own Space (MOOS), a youth design program that trains students to envision and build their own public space improvements. During his academic faculty experience, David taught graduate urban design studios, community charrette courses, and advised Master of Urban Design capstone projects. He developed the International Design Exchange (INDEX) graduate studio at KSU's College of Architecture + Environmental Design, an urban design course focused on waterfront redevelopment sites around the world. In recent years, his global urbanism research focused on redevelopment projects in Cuba and Romania. In addition to teaching at Kent State, David also created the Designing Urban Green Spaces course at Case Western Reserve University as a part-time lecturer in the SAGES program. David is Chair of the City of Cleveland’s Near West Design Review Committee and serves on the Board of Directors for Canalway Partners. An outdoor enthusiast, David enjoys birding, running, and kayaking to explore the cities he visits. Locally, he founded the Crooked River Commute, an annual 50-mile paddling journey from Kent to Cleveland along the Cuyahoga River. He holds a Bachelor's degree in Architecture from The Ohio State University and received his Master of Architecture from Kent State University. For inquiries, speaking requests, or project collaborations, please get in touch. Enter your email address to receive latest news and updates from Seventh Hill.